Kermit Jaediker was a newspaper reporter and Golden Age comic book writer during who shifted genres to write a paperback original crime novel called “Hero’s Lust” that was released in 1953 by upstart publisher Lion Books. Jaediker’s noir novel has recently been given new life through a reprint by Stark House who co-packaged the short book with two other Lion releases from the 1950s. Red is a newspaperman covering city hall in corrupt Crescent City. Since he was a young reporter, Red has been taking bribes to write stories in the paper favorable to the local political machine and the all-powerful Mayor - fake news before it was a thing. As a result of his boosted income and status, Red is a real man about town driving a convertible and bedding lots of fine dames. Red’s comfortable life as a hack for the current administration is placed in jeopardy by an anti-corruption mayoral candidate who appears to be gaining traction with the voters. The Mayor has a plan that will ensure his victory and needs Red’s help to hype it. The plan is to campaign on his administration’s crowning achievement - a state-of-the-art hospital complex for the poor in the city’s second ward. Enter Ann Porter. Pretty. Stacked. And suffering from tuberculosis so bad that she needs to have part of her lung removed. Red is to be her shadow through the procedure while documenting it all for his newspaper readers to illustrate the societal worth of the new hospital and delivering the Mayor an easy re-election. In the process of documenting Ann’s medical procedures, an intimacy between Red and Ann develops that helps illustrate Red’s humanity but opens the door to all sorts of derivative problems for the compromised reporter. Meanwhile, Red is being courted by a rival newspaper with a reform agenda interested in leveraging Red’s political knowledge to expose the Mayor’s corruption. Is Red willing to risk his comfortable life of status to be a real investigative reporter? What are the risks of being a snitch against the political machine who gave him everything? This is one of those stories where a morally-compromised man finds himself at a fork in the road and needs to make a tough choice between right and wrong with life-or-death consequences. “Hero’s Lust” is filled with inside info on the operations of the 1950s newspaper business and the blood-on-the-knuckles operation of a corrupt urban political machine. It’s a fascinating read and Jaediker’s writing is top notch. 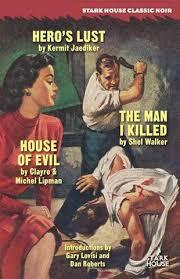 Anyone who considers himself a fan of 1950s hardboiled crime, should consider this one required reading. Highly recommended.